Ecological/Physical Description: A major portion of the Crest represents the climax oak-hickory forest of the southeastern United States. Physiographic and floral diversity within the area is reminiscent of the uplands of the East Gulf Coastal Plain before European settlers entered the area. Nearest weather station, with distance and direction from RNA: The nearest weather station is at Louisville located about 8 miles (13 kilometers) SE of the RNA. Annual precipitation (type, seasonal distribution): Records from 1951 to 1980 show 56 inches (142 centimeters) of annual precipitation, essentially all rainfall. The wettest months are usually February through May, and the driest August through October. Maximum and minimum temperatures: The average annual temperature is 63° F. (17° C). The coldest month is January, with an average daily temperature of about 39° F. (4° C), and the warmest is July, averaging about 79° F (26° C). Elevation: Elevation ranges from about 450 to 650 feet (137 to 198 meters). Geology and Soils: The Noxubee Crest is underlain by the Wilcox Group of Eocine age, which is mainly composed of irregularly bedded, fine to coarse sand, including some clay, shale, silt, lignite, lignitic clay, and iron ore. Maximum thickness of the Wilcox is about 400 feet (122 meters); it dips about 15 to 20 feet (4.6 to 6.1 meters) per mile (1.6 kilometers) to the Southwest. Thirteen soil series are represented in the RNA. There is a range from moist floodplain soils that cannot support equipment 2 to 5 months/year to droughty ridge soils. Soil characteristics have developed with little disturbance. Aquatic Features: Water in the area is from a natural springhead and from rainfall that runs off the ridges and slopes into ephemeral drains that empty into a tributary of Noxubee Creek. Plant Communities: Several oak species, scarlet (Quercus coccinea Muenchh. ), southern red (Q. falcata Michx. ), northern red (Q. rubra L.), cherrybark (Q. falcata var. pagodifolia Ell. ), black (Q. velutina Lam. ), white (Q. alba), swamp chestnut (Q. michauxii Nutt. ), and chinkapin (Q. muhlenbergii Engelm. ), combined with various hickories-- common shagbark (Carya ovata (Mill) K. Koch), mockernut (C. tomentosa (Poir.) Nutt. ), pignut (C. glabra (Mill.) Sweet), and bitternut (C. cordiformis (Wangenh.) 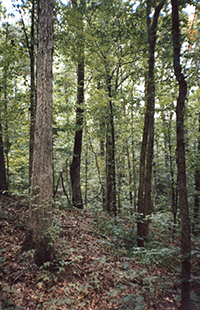 K. Koch)-- account for one half to two thirds of the trees in the upper canopy. Possibly due to a combination of tree age and drought, there is above normal mortality occurring among the larger hickories. Sweetgum (Liquidambar styraciflua L.), yellow-poplar (Liriodendron tulipifera L.), and American beech (Fagus grandifolia Ehrl.) are common along the drainages. At Risk Species: No endangered or threatened fauna are known to occur on the proposed RNA. There is one threatened plant species (ginseng, Panax quinquefolius). Wild ginger (Aarum canadense), sweet cicely (Osmorhiza claytoni) and hazelnut (Corylus americana) are at the southern edge of their ranges; large yellow lady’s slipper (Cypripedium calceolus var. pubescens) is a rare species. Common Shrub Species: There are advanced understory or mid-story trees 1 to 3 inches (2.5 to 7.5 centimeters) d.b.h. and 10 to 20 feet (3 to 6 meters) tall over much of the area. Most common understory species are flowering dogwood (Cornus florida L.), elm Ulmus sp. ), ash (Fraxinus sp. ), red maple (Acer rubrum L.), and sweetgum. Common Herbaceous Species: A total of 1425 specimens has been collected in the RNA, which represents 452 species in 93 families of vascular plants and 30 species in 19 families of bryophytes (Moore 1993). Common Mammal Species: Noxubee Crest is in the Choctaw Wildlife Management Area. White tail deer (Odocoileus virginianus), eastern cottontail rabbit (Sylvagus floridanus), raccoon (Procyon lotor), and many nongame animals live in or use the RNA. No endangered or threatened animals or birds are known to occur. Common Bird Species: Bob-white quail (Colinus virginianus), wild turkey (Meleagris gallopavo), and many nongame birds live in or use the RNA. No endangered or threatened birds are known to occur. Moore, A. D. 1993. A floristic survey of the Noxubee Crest Natural Area of the Tombigbee National Forest, Thesis (M.S.) - Mississippi State University: v, 64 leaves.